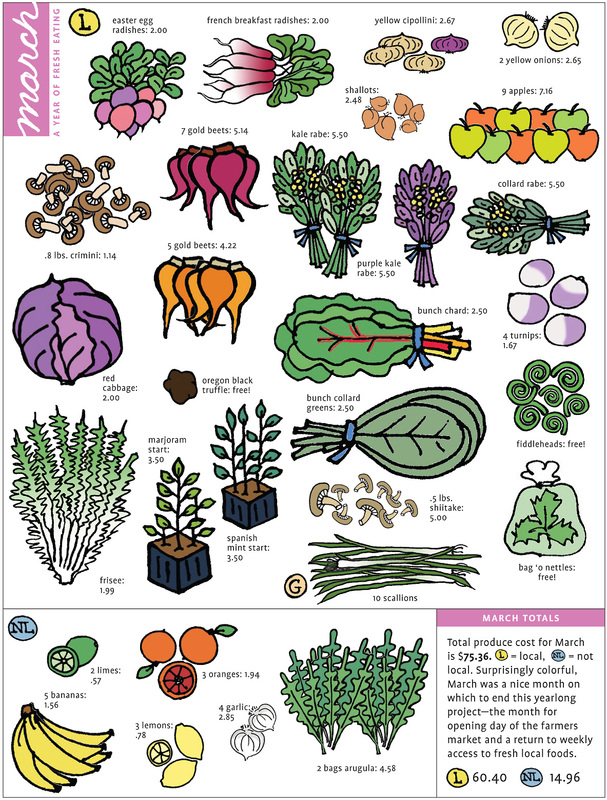 This month marks the final installment of a “Year of Produce” in which I charted my fresh produce purchases in illustrated form for a year starting in April 2010. I was curious to see if I put my money where my mouth is about eating locally and, by definition, seasonally. Yes, 2010 was so last year. But April is so now! Which means you can start all over again if you missed the whole thing. Scroll down for March as well as a mini image of each month that links to that month’s post. Each one has some combination of recipes or recipe links, preparation ideas, thoughts on eating locally and other good stuff. So please explore! I have no idea if nearly $1000 spent on fresh fruit and vegetables is a lot or a little, not to mention that 80 percent of that was spent on local food. But I’m happy with a number like that. A cursory look at a couple websites leaves me embarrassed to say that I think I eat a lot, if my records are to be believed. I’d be interested to know what percentage of my entire grocery bill is spent on fresh food. On the other hand, there’s also just eating and enjoying! From the garden I harvested roughly: 5 bunches chard, 10 bunches kale, 5 bunches broccoli rabe, 10 lbs. beans, 2 bunches radishes, 18 zucchini, 12 beets, 15–20 carrots, 16 lbs. tomatoes, 37 peppers, 14 leeks, 30 scallions and handfuls of lettuce and bundles of herbs. I couldn’t survive on my garden, not with my gardening skills, but it’s immensely satisfying to run downstairs and yank a beet out of the ground. I planted garlic in the fall. I can’t express how excited I am to have my own garlic! I mentioned early on that my definition of local could be debated. I included Oregon and Washington. A Washington carrot might have less far to travel to Portland than would an Oregon carrot, given that Portland sits at the border of Washington State. I also knew that it would be hard to find out where that cameo apple was from in Washington—500 miles away, or only 50? Grocery store clerks don’t know that kind of thing. To keep it simple, I included the whole state. This article, “Locally grown? It depends on how you define it,” landed in my in-box this morning. Stores like Safeway, Whole Foods and Wal-mart, as well as chefs and even states, all define local differently—7-hour drive, 150 miles, 30 miles, same state. Local defies definition, at least for now. My home state of Maryland just passed legislation to require a clear definition of local. The implications of no clear definition are obvious: the word local has caché and companies know it. Localwashing is upon us. If you care whether something is local, you have to ask. In August, I wrote about a debate that raged in the press in response to one journalist’s piece “Math Lessons for Locavores.” It’s become popular to trash positive concepts like local, organic and sustainable. Maybe journalists are bored. Maybe it’s a conspiracy by food manufacturers. As I started compiling this final month’s layout, it was April 1. Between juggling client projects, hosting an out-of-town guest, finishing a friend’s wedding invitation and getting over fatigue from a previous night of karoke, I barely realized it was the 15-year anniversary of my business—Allegro Design. It was also my 10-year anniversary of relocating here from the east coast. With all that going on, I knew that nothing momentous was going to happen on this particular April 1. Who had time? But after the dust settled and I finished this month’s post, I thought “Huh, I just wrapped up a yearlong project on April 1. Whad’ya know?” This realization struck as I finished reading Gretchen Rubin’s Happiness Project, a yearlong venture of being happier. In one chapter, she recalls coming across a criticism of “method journalism,” or the fad of doing something for a year, like Julie Powell of Julie & Julia fame. Both these undertakings were far more complex than my project. But still. It’s been very rewarding to stick to a monthly project, but there were times when I dreaded the 4 to 6 hours that each post would take. Drawing, scanning, coloring, arranging the layout, adding captions, searching for recipes, writing posts. This work often took a back seat to everything else, wedged between client work and laundry. Sadly, I often felt guilty doing it. But to see in visual form what I’ve eaten for a year is a valuable tool, not to mention fun. One of these days I plan to examine each one more closely for patterns, or else gaps in what I ate. Because eating the rainbow is important for your health, I like to think I enjoyed the full spectrum. It will be a relief to stop writing down every single item, not to mention drawing new items each month. A side benefit of this activity is that I’ve become a Quicken addict. A few people asked if I planned to do another year. “No way!” I howl. Besides, I have other fennel to fry. Several other food-related creative projects are marinating. Year at a Glance: Collect all 12! Share with a friend! Like ’em! Tweet ’em! Eat ’em! Click on ’em to link to that month’s post. Captions below each month give you and idea of what I covered that month. And here is March in full. In addition to the spring rabes (raabs), which I wrote about here, you’ll notice some wild forage. Read my farmers market post “Fiddleheads, Nettles, Truffles…Oh, My!” Try my savory Herbed Nettle Pancakes (or substitute any green if you can’t find nettles). 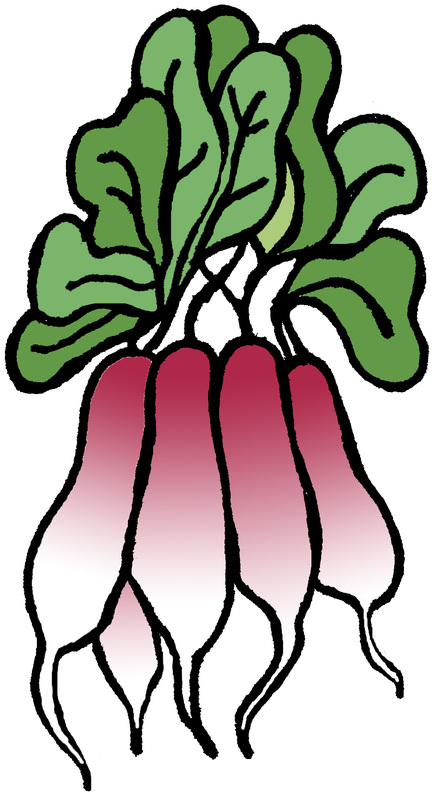 I love the way radishes look, and their names—easter egg, french breakfast, watermelon—but they make my stomach burn. But my mother will stand in the kitchen and pop salt-covered radishes into her mouth like candy. Here’s a Radish, Fennel, Orange Salad recipe that is colorful and zippy. Even I like it! You can also download March as a high-res PDF. About a year ago, a former design student of mine asked about how to change her eating habits and how to do it affordably. I was flattered that I’d somehow become a resource. Her list of questions revealed not just curiosity but anxiety. Where did I buy meat, or did I even eat meat? How do I afford fresh food? Where do you even start? She asked questions that probably plague a lot of people. Even I stare blankly in the fridge wondering what the hell to do. I fall into ruts. I end up eating way too much pasta. I wing it most of the time instead of following recipes, even though recipes make you learn more. • Buy produce at its peak, not when it first comes into season. Tomatoes are a perfect example. They start at $4 per pound. By late August and into September, they go down to $1.50 per pound. This doesn’t apply to everything though, like asparagus, which hovers at $3.00 per bundle. But its season is short. • Add small amounts of a more expensive item like fennel to a dish—enough to enjoy the flavor but not so much that you break the bank. Thinly shaved fennel on a salad lets you enjoy that signature licorice flavor. You don’t have to make an entire gratin with it. Apply this to any vegetable. If you balk at a $4 artichoke, buy one only once in a while. Steam it and share with a friend as an appetizer before your meal. Just enjoy all its fabulous artichokiness and skip one latte. • Grown your own if you have space, especially high-ticket items like tomatoes, beans, herbs and greens. You can ghetto grow tomatoes right in a big bag of potting soil! As long as you have sun, you don’t have to spend much money on supplies. If I only had a small space, I’d grow herbs and forget the rest. They take food from blah to wow, but in an often subtle, sophisticated way. And herb garden is guaranteed happiness. • Go to pick-your-own farms. As much as I love the farmers market, it is expensive because farmers have to pack up produce, haul it to market, pay for a booth and pay employees to man the booth. Pick your own and you get fresh air, a view and affordable produce. Most places have a market on site selling what grows right on the farm. Try berries for $1.50 per pound versus the high price at a grocery store. Stuff that freezer and enjoy berries all year! • Learn to love certain vegetables like cabbage. It’s relatively cheap and you can do a million things with it. Plus it’s nutritious. • Get comfortable with improvising. Buy what’s in season and then go home and look up recipes on Epicurious.com. You’re far more likely to eat better if you don’t worry about sifting through recipes and THEN doing your shopping. Don’t get hung up on following recipes to the T. This seems to be the single biggest stumbling block that prevents people from cooking more. Don’t worry about messing something up. It’s a few wasted ingredients and you probably learn more than if it turned out great! • Eat grains and beans. Keep a steady supply of dried grains and beans, which are very affordable, filling and healthy. You’ll be amazed at how far you can take them. Soak beans overnight and then cook them the next evening (or on a weekend morning). Make more than you need so you can turn some of the cooked beans into a soup and the rest into any number of dishes. The same goes for grains like barley, spelt, farro, quinoa and wheat berries. Cook a big batch and use them one day in a salad, another day in a soup, another day as a warm side mixed with beans and greens. Heck, that’s a one-dish meal right there. • Keep a well-stocked pantry. Katherine from Cook With What You Have emphasizes this. As the name of her business suggests, you can get into a cooking groove by using what’s around and by having access to staples that are building blocks for many meals. Subscribe to her blog and think about taking a class. Well, if that doesn’t just take the cake. I can’t think of a better way to wrap up a Year of Produce. That’s all folks. Thanks to those who visited regularly. What are you eating this spring? What are you most excited about? Is there one vegetable you’ve never tried but plan to? That year’s worth of posters looks so impressive! I could see the illustrations on kitchen towels or something! well, maybe in Portland. Here tomatoes are always around $4/pound…maybe because they don’t really like the summer’s heat/humidity? Have also been meaning to ask: where do you get farro? At Whole Foods (only place I’ve seen it here) it’s imported from Italy and $10 for a 1-pound bag! ummm, no. Thanks Eileen! It was no small amount of work getting that grid of images. Had to use a Dreamweaver workaround. I’ll send you some tomatoes and farro : ) Actually, our stores have been out of it for a while. I heard something about a limited supply. So I’ve been using spelt and wheat berries, both a little less chewy than farro IMHO. Jane: That is the most beautiful and thorough piece of work on food and healthy eating . The art work is incredible What great kitchen art it would be. And the verbiage inspires change that I may even try myself. Localwashing!!! Oh no. I am definitely guilty of making a choice based on the word “local” but I don’t really know how local it is. So my definition has become local to the northwest. I love seeing the illustrations in one large group. I also thought of making one into a screen saver. Is that possible? No guilt required. Especially for you! Now your blueberries, those are local! Speaking of…I just realized how many berries are still in the freezer. Time to start making smoothies. Love your screen saver idea. Perhaps a horizontal format minus my costs. Maybe I’ll make you one.